Imagine this scenario. How would you like to pull something out of the back of your closet and turn it int0 big cash dollars? Something you had stored away and pretty much forgot about over time. Maybe as the years pass you considered throwing it away, or selling it for a few bucks at your garage sale. Then you finally pull it out of the closet and wisely decide to sell it on eBay. You end up being way glad that you did, because as the auction progresses you realize you just may have something big on your hands! In another example of my watching other shoppers at the Goodwill store, I bring you this Carhartt winter coat. 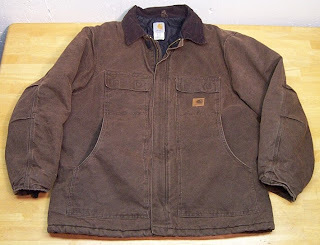 Carhartt is another "hot" product to look for at thrift stores and garage sales. Carhartt coats, jackets and bib overalls are rugged, heavy and made to last. Next time you pass a construction site on a cold day, take note at what the guys are wearing. Most will be sporting Carhartt coats. The company doesn't just sell work clothes either. They also make outdoor sportsmen gear like camouflage hunting coats and parkas. Check out their website at http://www.carhartt.com. Getting back to my stalking story, I was flying through the Men's shirt racks at Goodwill when I noticed an older gentleman pull a Carhartt coat off the "newly arrived" rack. (These are the mobile racks the employees use to bring out the "new" merchandise.) Normally I make my way over to these racks, but the old-timer beat me to it. So I kept my eye on the fella as he tried on the Carhartt coat. He walked over the mirror to check out the fit. Taking his sweet old time with the coat, it was clear he was on the fence about buying it. After a little more fiddling with the zipper and snap pockets, he finally took the coat off and hung it back on the rack. I was relieved, there's nothing worse then watching another shopper beat you to a great deal! I waited for him to walk away from the rack, then swooped in on the coat like a vulture. The coat was priced at $25. Being a five dollar shirt guy, this was a little more then I was use to spending. But I knew I could at least make my money back on the coat. There was also the option of just keeping it for myself. I could always use a cool, rugged style like a Carhartt. Trying it on in the store, it seemed to fit me pretty well but was a little long in the sleeves. After several more admiring poses in the mirror, I decided the coat was coming home with me. I walked over to the cashier and as I did, the old timer stood in line right behind me. He noticed I was holding the coat and commented that he had just tried it on. Trying not to sound too stalker-like, I told him, "Yeah, I noticed you tried it on. It's a nice coat right?" He agreed, raving about the great price and how he almost bought it. We continued to bond over the Carhartt and as I left the store, he told me one last time how I got a great deal on the coat. Talk about positive reinforcement! Like the old-timer, I seriously thought about keeping the coat. But standing in front of the mirror at home, I just couldn't get past the sleeve length. It was just a bit too long. I looked like a little kid in his Dad's coat! Knowing this was a deal breaker, I decided to sell it. The timing to sell a good quality working man's coat was perfect. It was late Fall and the weather was starting to turn cold outside. Guys in the construction trades always need a heavy, durable coat for outdoor work. So I posted the coat on eBay with a starting auction price of $25-the exact price I paid for it. Any higher bids would be profit. (Less eBay fees of course.) It's also important to remember to charge enough to cover your postage costs. Coats like these are very heavy. You don't want to short yourself by not charging enough to cover shipping. A flat rate of $15 is a safe bet, but you can always go to the USPS website to calculate an exact rate. In the end, I was glad I spotted that old-timer trying on the coat. My Carhartt sold at auction for $60 dollars! A nice profit of $35...not bad for an item I almost missed. Keep an eye out for any Carhartt products at thrift stores and garage sales. If you scoop them up at the right price, there's some great money to be made. If you've flipped any Carhartt or similar construction or sportsmen clothing, let us know in the comment section below. Dude's note: I am re-posting this popular blog piece from 2010. In my next "edition" you'll understand why....enjoy! Oh no, now my wife has gotten the bug! For years, she has watched me return home from the garage sales loaded down with good stuff. Occasionally she has accompanied me to the sales. I found having Mrs. Dude along helpful since she knows about products that I am not familiar with. For example, she clued me in on "Pampered Chef" and how women love buying the gadgets at parties. So I tested the Pampered Chef market and quickly learned the gadgets are hot sellers. A Pampered Chef item found at a garage sale is often like finding money laying on the table. If it's new and still in the box, (which for some reason I find fairly often) it's a guaranteed sale! So having my wife with me as I make the rounds is like an extra set of eyes. My only complaint is while I like to move fast through a sale, she likes to linger. I usually end up standing at the bottom of the driveway, asking if she's ready to go. (Time is money!) Other times we take separate cars to cover more sales. Mrs. Dude is all for this strategy, then she can take her sweet old time without me trying to hurry her along! So last Saturday she hit a garage sale solo and came back with the above "Bombay Company" hall table. Mrs Dude scored a sweet deal, paying only $30. 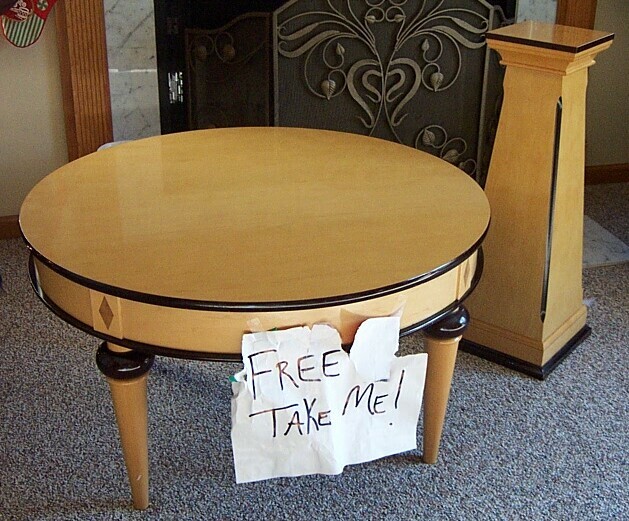 She briefly thought about keeping the table, but it doesn't go with our furniture. So instead, she posted on Craigslist for $60. Amazingly, it sold later that same day for her asking price, doubling her money. Moral of today's story is this: everyone has a knowledge base that they can use to profit at the yard sales. I know the value of "guy" stuff, my wife knows things like furniture and related stuff. Everybody knows something about something! So take your spouse, a friend or even your kid to the yard sales. With their help, you may find a great deal that you would have missed out on! Dear Buyer, Thanks for returning the pound of chuck roast! Oh, the trials and tribulations of being an Ebay seller! Occasionally I'll hear from a buyer complaining that I improperly packaged an item for shipping. In most cases, the item didn't get damaged. The buyer just wants to nit-pick, claiming I could have packed the thing a little better. When I receive these e-mails, I have to fight my urge to respond with a wise-crack. Instead, I bite my tongue and put on my "customer service" hat. Believe me, it's hard to do sometimes. But I look at it this way-although the buyer is being a royal pain, what's the harm in replying in a nice, friendly manner? Even if I think they're dead-wrong, there's really no extra effort on my part in being customer friendly. All it takes is a few keystrokes. Heck, I can even make gagging faces and roll my eyes while typing the friendly response...they'll never know! "Sorry to hear you were disappointed in how the item was packed. You're right, I am definitely going to be a little more careful when packing the (______) in the future. Thanks for letting me know. I hope you enjoy the (__________.)" In this scenario the buyer is just looking to be reinforced and told they were right to complain. It's a psychological game your playing with them. Sort of like defusing a ticking time bomb! But your real intent is to simply calm them down so they don't torpedo you with poor eBay ratings. Most of the time this works with a nit-picky buyer. More then once, I've received a response thanking me for getting back to them. They'll even tell me how much really they like the item. When I get a response like that I know the bomb has been defused! I bring this issue up because while a buyer can complain about poor packing, the seller can't do the same when the situation is reversed. Recently, a buyer returned a beautiful LL Bean shirt claiming it didn't fit him. (This despite the fact that I clearly stated the shirt size and measurements.) Knowing eBay sellers can't win this battle, I told the buyer to return the shirt for a full refund. Several days later I received the above "package" in my mailbox. The seller had tightly rolled up my beautiful LL Bean Shirt like some Persian rug. He then shipped it in brown grocery bag paper! I am lucky the police didn't knock on my door. 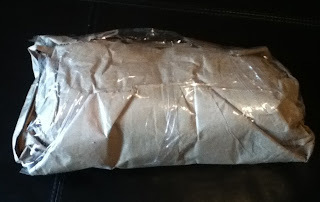 This suspicious package looked like an illegal drug shipment that came across the Texas border. It also reminded me of a few pounds of ground chuck roast. The type "Sam the Butcher" use to wrap up and hand over the counter to Alice on the Brady Bunch! Inside this brown paper bag, I found my once beautiful LL Bean shirt. It was all wrinkled and crumpled, like something from the bottom of my son's clothes hamper! Now here's where the double standard comes in. What would a buyer think if they received a shirt packaged like this? Wow, I could see my five-star rating plummet as soon as the wrapper was opened! But even though the buyer did an awful job packing the shirt, did I complain? Nope...I just bit my tongue and gave him his refund. So the guy got his money back and I re-washed, dried and ironed the shirt. I'll eventually re-post the shirt and make my money, but the eBay "double-standard" is frustrating and annoying!